With over 3 billion cells, each with a specific job, your body is a wonder. Some of the cells help you see; others give you your sense of taste or touch. Still other cells allow your body to jump, run, or throw a ball. But how do the cells “know” which job to do? How do they “know” how to do their job? The answer is DNA, which is sort of like your body’s blueprint or instruction book. DNA tells the cells how to do their job, according to Rhys Baker at Owlcation. DNA, or your body’s blueprint, is written in a special alphabet. This alphabet contains only four letters – A, T, G, and C. The letters we read in books or on a computer screen are flat. The DNA alphabet isn’t flat. It’s more like a beautiful, curved ladder, called a double helix. The letters are the rungs of the ladder; the rails of the ladder are made of special atoms and sugars. The four letters of the DNA alphabet are similar to the pieces of a jigsaw puzzle. A and T fit together and G and C fit together. In our alphabet, we can make all kinds of words that vary in size. In the DNA alphabet, all words are only three letters long. These words are called codons. A word might look like ATG or GCA. String these words together and you can make a DNA sentence called a gene. Genes tell each cell to make a protein, which gives the cell its specific job. 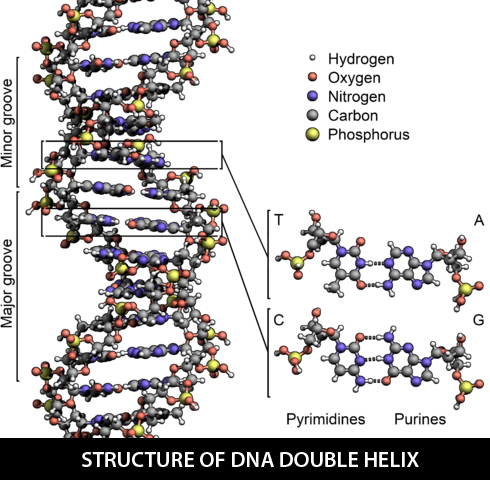 DNA is a nucleic acid made of bonded strings of nucleotides with a backbone of phosphate and deoxyribose. There are around 210 different types of cells in the human body. 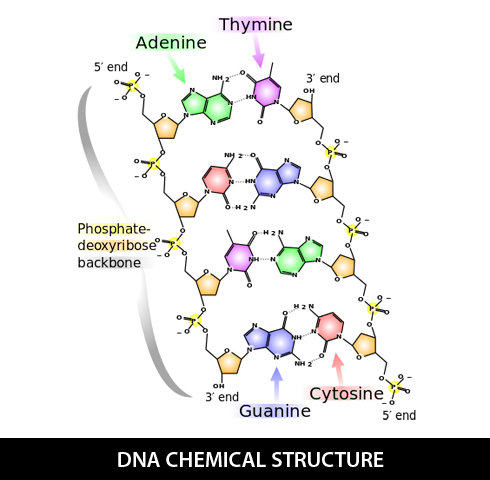 DNA stands for deoxyribonucleic acid. The letters of the alphabet also stand for longer names. A is short for adenine; T is short for thymine; C is short for cytosine; G is short for guanine. Cells that are similar form into groups known as tissues. Tissues form organs, such as the lungs, stomach or liver. These organs link to other organs to create a system, according to Richard Walker in “How the Incredible Human Body Works.” For example, the stomach is linked to the tongue, esophagus, intestines, colon, and other organs to form the digestive system. DNA can separate to form single strands of DNA. These new strands can form exact copies of themselves to form a new double helix. If you unraveled the DNA in your body and stretched it out, it would reach to the sun and back. The letters of the DNA alphabet (codons) make sentences, known as genes, which tell your cells what to do, but how does the DNA alphabet determine which sentences to write? All life on earth, including plants and animals, contains DNA and genes. But what makes a human a human and not a blue whale? All animals contain some genetic code (genetic sentences) that is similar. Humans, for example, share 98.4 percent of their DNA with chimpanzees, according to “Human Body,” by Miranda Smith. But, that little bit of genetic code that is different is what makes us unique. Every human on the planet shares 99.9 percent of the same DNA. That 0.1 percent difference is what determines your eye and hair color, how tall you are, your skin color, and perhaps even your natural athletic ability. Half of your genes come from your father, half from your mother. And even though the genetic code contains only four letters, these four letters can form billions of different combinations. So, unless you are an identical twin, you won’t be exactly like your siblings, although you may be similar. Humans and slugs share 70 percent of the same DNA! Have you ever heard the term, family resemblance? Often, members of a family will look a lot alike. They may have the same hair color, eye color, body type, and even mannerisms. Family resemblances can stretch over many generations, so you may look a lot like your grandfather or grandmother or a favorite aunt or uncle. You might find old photographs of a family member who lived 150 years ago that looks like you. People may share characteristics based on where their ancestors came from. For example, if most of your family’s ancestors came from Sweden, you might be tall and blonde. If most of your ancestors came from France, you might be petite or have brown eyes. This isn’t always the case, but it’s fun to find out about your roots. In addition to physical characteristics like eye color, certain diseases tend to run in families. One family might be prone to heart disease while another family is prone to diabetes. Knowing about your family’s history can help you stay healthier by watching out for those diseases. Doctors sometimes use genetic testing to identify potential diseases before a baby is even born. Each cell nucleus contains 46 chromosomes in 23 pairs. These chromosomes pass on the genetic information that makes us who we are. In each pair, one chromosome comes from the father, one from the mother. One of these pairs determines whether you are a boy or a girl. Boys have one X and one Y chromosome; girls have two X chromosomes. DNA is worth studying simply because it reminds us of how beautifully simple, yet complex, all life is. But understanding DNA has some practical purposes too. Scientists can look at DNA to understand how diseases are passed on and how they work. By breeding disease-free plants and animals, they can improve crops and livestock, allowing farmers to grow more food and feed more people. Scientists can use these same tools to prevent and treat diseases in humans. For example, in 1978, scientists created synthetic insulin made in a laboratory. Insulin is a hormone that controls blood sugar. People with diabetes can’t make their own insulin and can become very sick. Now these people can use man-made insulin to keep them well. In the future, scientists hope to find cures for diseases like cancer, multiple sclerosis, and Alzheimer’s disease. The study of DNA can help us understand more about differences in development. Scientists, for example, have discovered that autism can run in families. Traits, such as athletic or musical ability, can also be passed down. DNA can be found in our hair, skin, and bodily fluids. This DNA can be used to identify us. Crime investigators have used DNA to find criminals by testing hair or blood samples found at crime scenes. DNA can even be used to identify someone who died many years ago. DNA was first used in 1987 to catch a criminal; in 1989, it was first used to prove someone’s innocence. DNA can be used to find parents and children. For example, after the 2004 tsunami in southeast Asia, many parents and children were separated. A baby was brought to a hospital in Sri Lanka and hospital staff wondered what to do. Many parents came forward, hoping the baby was theirs. Doctors used DNA to match the baby with his parents. After 9-11, many of the bodies found at the World Trade Center were burned so badly that they couldn’t be identified. DNA testing allowed families to find their loved ones’ remains. In 2001, scientists made a map of all the genes that make a person. The discovery of the complete DNA sequence, known as the human genome, has opened the way to new medical discoveries. Between Gregor’s experiments with plants and the 2001 genome success, many other scientists contributed to our understanding of genetics. In 1869, Friedrich Miescher discovered a substance that was later named nucleic acid, a building block of DNA. This substance is only found in chromosomes. Phoebus Levine identified DNA’s alphabet letters, adenine, cytosine, guanine, and thiamine, as well as sugars and phosphates that make up DNA in 1929. In 1953, Francis Crick and James Watson made the double helix model of DNA that we still use today. The two scientists received the Nobel Prize for their contribution to genetics. English geneticist, Alec Jeffreys, discovered how use DNA fingerprinting to identify individuals. Clones are living organisms (plants or animals) that contain the same, exact genetic material. Identical twins are natural clones. Scientists have discovered how to create clones in a lab. In 1997, scientists cloned a sheep. National Institutes for Health: View a cartoon about DNA. Scholastic: Learn more about how investigators use DNA to solve crime. PBS Dragonfly TV Play a DNA game. Chem4Kids Discover the biology behind DNA. Family Search Hunt down your ancestors. Declan, Tobin. " DNA Fun Facts for Kids ." Easy Science for Kids, Apr 2019. Web. 24 Apr 2019. < https://easyscienceforkids.com/dna-your-bodys-blueprints/ >.